The family and I loaded up the mini-van this morning and we're trucking it down to Orlando for some theme park hopping. 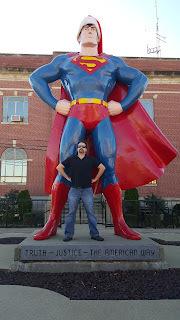 Along the way, we decided to make a quick stop in Metropolis, IL, home of the Giant Superman statue in Superman Square. DC Comics first mentioned the fictional town of Metropolis in Action Comics #16 (September 1939). It was modeled after Toronto and New York, not the little hamlet of 6,000 people in Illinois. Still, the inhabitants of Metropolis, IL embraced the notion of being Superman's home town and, on January 21, 1972, DC Comics officially declared Metropolis, IL the "Hometown of Superman." On June 9, 1972, the Illinois State Legislature passed Resolution 572 that confirmed this, declaring Metropolis the "Hometown of Superman". The next year, the "Amazing World of Superman" museum opened in town. Metropolis had plans to build a thousand-acre, $50 million Superman theme park featuring a 200-foot-tall statue of Superman that cars would drive under when entering the park. Unfortunately, the 1973 oil crisis hit Metropolis especially hard and the plans had to be scrapped and the "Amazing World of Superman" museum closed its doors. The town was able to raise enough money in 1986 to erect a life sized fiberglass statue of Superman, but the Man of Fiberglass fell victim to vandalism. This led to the statue being replaced by a 12 foot bronze statue that still stands in front of the Metropolis court house today. And you'll find the Superman Museum across the street with interesting exhibits such as George Reeves' belt and the green power crystal from the 1979 movie. 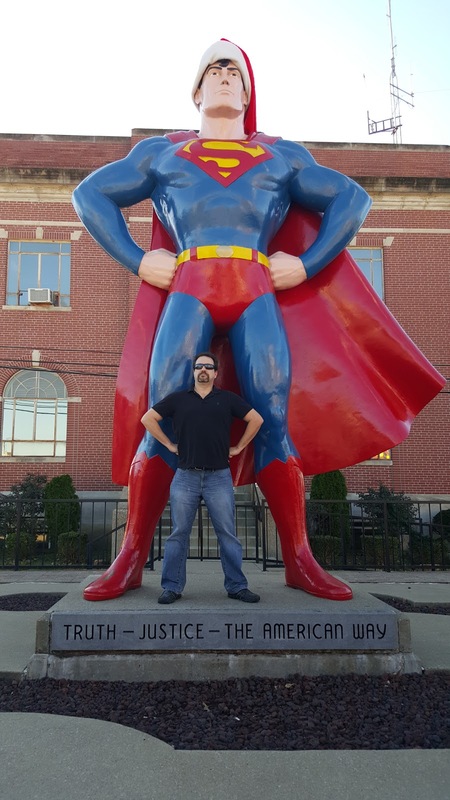 A somewhat lesser known, more mild mannered statue also exists in Metropolis, IL. 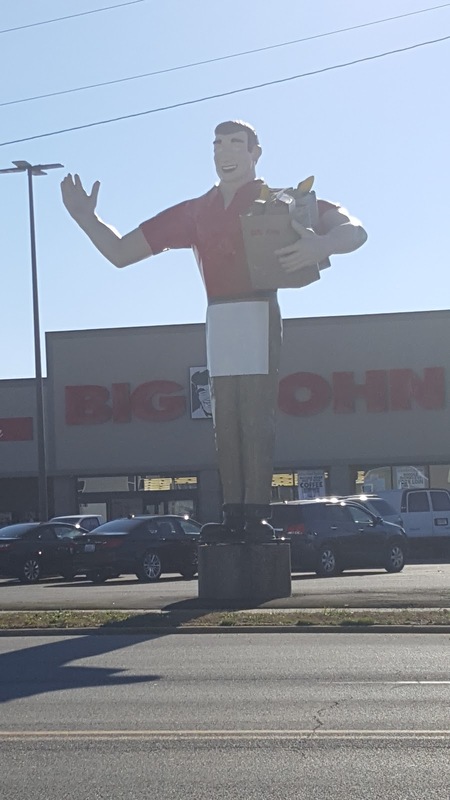 Constructed in the 1960s, Big John the grocery clerk stands in front of the Big John Grocery store near the Metropolis welcome sign. The owner of the Big John grocery store had wanted something to symbolize the hard working Southern Illinois people. He came up with the statue, representing the coal mining industry that was the driving force in Southern Illinois at that time. It relates to the song, "Big Bad John". 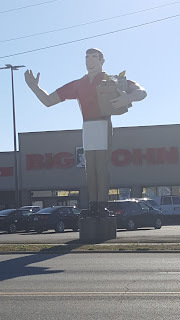 Originally, the Big John statue held a bag of groceries in each arm. Big John's right arm fell off in August of 2014 and it was returned without the grocery bag in May of 2015. Now, I'm not saying that the Big John statue and the Superman statue are the same statue....but the two statues have never been seen together in the same place before.